What Our Customers Say: "The trick with bike locks is to make sure yours is better than next. This does the job! ", "Great quality folding lock, durable and easy to use", "High quality, Well Worth the Price!" and "Five Stars, amazing!". 1.) Tested and 'Tested' - Not only do we lab-test our locks, but we give our locks a serious GO ourselves as well. Fun ensured! 2.) Serious Security - With 1.3" Steel Bars and specially designed Steel Rivets this lock means serious security! 3.) Convenience - With a Sturdy Mounting Bracket with non-slip Velcro Straps a Link Construction that allows compact folding parking your bike every day is like a walk in the park. 4.) Durabililty - This lock has extra soft 2-components coating to prevent damage to the bicycle's paintwork, for durability of both your lock and bike! 5.) Our focus - Sigtuna Gear believes that we can only grow with 100% satisfied customers. Our customers experience that, we know you will to! Sigtuna Gear is our business, but most of all we are a Swedish team of bike lovers. For us "it is all about the ride". We want therefore nothing more than to protect your valuable ride. All it takes is an investment of 15% of your bike value in quality bike security. This 33" long Folding Lock with Mounting Bracket is CELAB-certified (90278218443) and gives your bike maximum protection wherever you go. 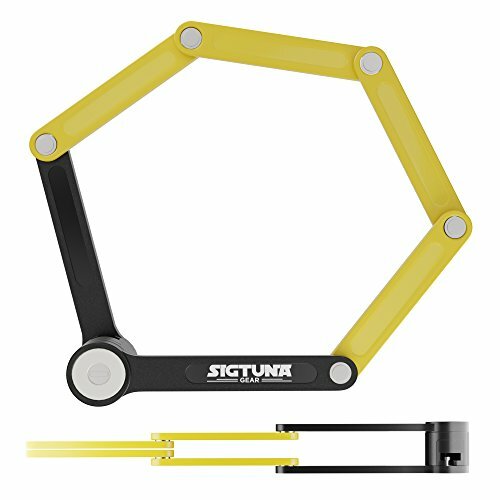 ► Click "Add to Cart" now to BUY your Sigtuna Gear Foldable Bike Lock - order NOW! PROTECT WHAT YOU VALUE ► This High Performance and Certified SIGTUNA Bike Folding Lock is made of special hardened ABS Steel bars and rivets and provides Maximum Security for your bike in all risk ares! HIGH-PERFORMANCE ► This SIGTUNA Folded Bike Lock is made 5mm Steel Bars, with specially designed rivets for extensive holding power against leverage attacks! DURABLE and EASY TO USE ►This Bike Fold Lock comes with soft-touch Coating on the bars and matching silicone Lock Body Cover to protect your bike's paint job and an a easy-to-mount Mounting Bracket. 100% MONEY-BACK GUARANTEE ► If this SIGTUNA Folding Lock is not the favorite you ever owned - some say it is heavy, but that means quality - just send it back and get a 100% refund. SIGTUNA stands for its products. Our customers love that, we know you will too! BUY YOURS NOW ►► Want to have it tomorrow? Click "Add to Cart" NOW to buy your SIGTUNA Foldable Bike TODAY and know that your bike is 100% secured with this folding lock! If you have any questions about this product by Sigtuna Gear, contact us by completing and submitting the form below. If you are looking for a specif part number, please include it with your message.